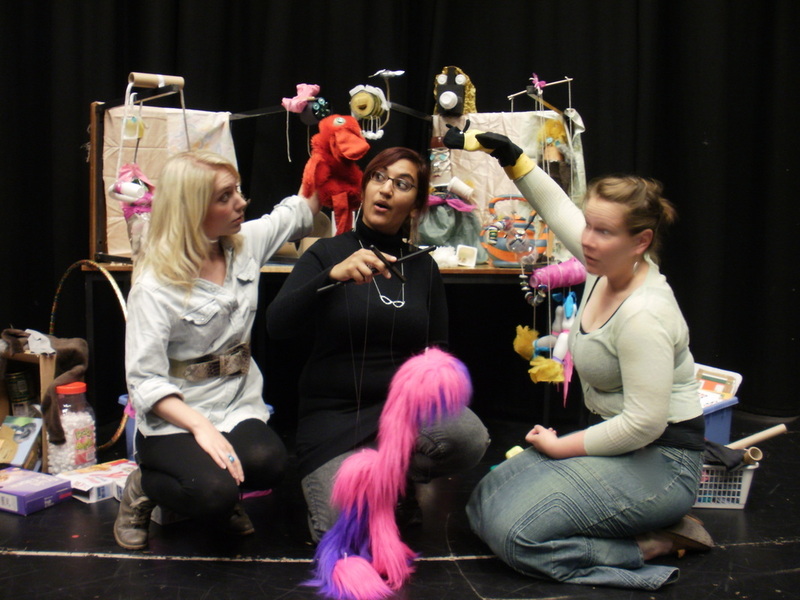 Moulded’s puppet workshop developed from our own interest in puppetry and the production Edith’s Big Adventure. The workshop includes basic skills on how to manipulate and give emotion to puppets and the opportunity to plan and make your own puppet from a variety of materials commonly found in household recycling, as well as some extra special bits and bobs! Then the puppets and puppeteers take part in a fun challenge. The aim of the workshop is to facilitate logical and creative thinking in the context of designing, selecting and constructing a puppet that has a moveable function. Then applying the skills learnt at the beginning of the session in the puppetry control challenge. Moulded (Natalie, Soniya, Emily) in front of - and the array of puppets designed and made by Staff and Students of Barton Peveril College and Moulded during our puppet workshop. Moulded’s puppet Edith pats Bruno the dog after training him to jump through the hoop! Edith is a rod puppet and can be operated by one or two puppeteers. The workshop was really great fun and inventive, it made us all feel really creative. The workshop was great fun, especially coming up with characters and making our own puppets. Thank you for a really fun time! Enjoyed making the crocodile/rat thing. A lot of fun, thank you. Was really enjoyable. Lots to do, thank you. Better than lessons, so thumbs up. Should of devised a performance. Really enjoyed learning how to act with the puppets and making a puppet was awesome. OK, i'm not great at the sticking thing but I REALLY enjoyed using skills I NEVER usually use. The creative writing element really useful for English! And didn't the time go quickly! ?